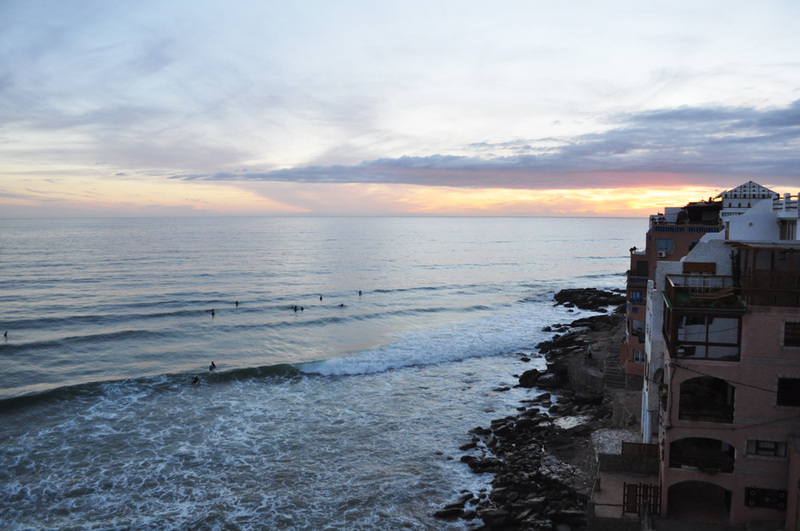 Book an unforgettable Moroccan surf holiday today. Beginners can join us at the Hashpoint Surf School, experienced surfers can explore the coast with our local surf guides. Learn how to surf in Morocco’s safe beach breaks or improve your surf level on one of the many right-handers to find here. Our qualified teachers will guide and teach you every step of the way. We offer surf school packages for all levels and make sure you will reach that next one. The lessons include 2,5 hours of lessons in the morning and 2 hours of practice time in the afternoon, under the supervision of our teachers. Each surf instructor teaches a group of max 8 students. Once a week we organise a surf talk on the terrace where we catch up with you on your progress and your surf knowledge. Theory is important and we want to you really know what surfing is all about. The complete package for beginners who want to learn to surf. We will provide daily lessons, along with any equipment that you need. We’ll help you fit your wetsuit, choose your board, and be there with you in the water so that you have the best surfing experience possible. We love this sport and we go out of our way to make our beginners feel at home in the surf and in the surfing community. Have you already had a few surf lessons? Do you already know how to get up, and feel ready to take the next step? With our intermediate package we’ll take you into the the green waves and teach you how to navigate the surfing ‘line-up’. Our qualified and experienced surf instructors will help you reach the next level and teach you everything you need to know. WHAT DO THE SURF SCHOOL PACKAGES INCLUDE? HOW MUCH DO THE SURF SCHOOL PACKAGES COSTS? We also offer great discounts for groups of friends or university groups. Surf school packages are bookable from 5 nights on. If you wish to have a 3 nights stay with lessons please check out daily packages. **Arrival and departure days are not included in the daily surf lessons. Now offering Surf and Yoga, combining daily surfing and rooftop yoga classes. Unwind at the end of your surfing with a relaxing yoga session. Perfect to stretch your aching muscles and relieve tension and stress from your body after a day of surf and sun. Enjoy any surf school or guiding package and add yoga on top. This package is available for any level of surf school/guiding. We offer yoga classes 4 times a week on our rooftop terrace where you enjoy a panoramic view over the ocean and Morocco's famous sunsets. Our classes are open to the Hashpoint surfcamp guests and visitors from elsewhere. WHAT DO THE SURF & YOGA PACKAGES INCLUDE? Surf packages are bookable from 5 nights on. If you wish to have a 3 nights stay with lessons please check out daily packages. Join our experienced, local surf guides on their daily search for the best waves along the Moroccan coastline. With more than 10 local spots, you can be sure to find some awesome waves. WHAT DOES THE SURF GUIDING PACKAGE INCLUDE? HOW MUCH DOES THE SURF GUIDING PACKAGE COST? Do you already have an accommodation or do you want to join only a few days of surf? We can offer you the following package deals. The surf lessons and surf guiding are full days and include lunch and drinking water. The lessons include 2,5 hours of lessons in the morning and 2 hours of practice time in the afternoon, under the supervision of our teachers. Enjoy everything our camp has to offer without including surf instruction or surf guiding. You can still rent our boards and wetsuits whenever you need it and we’ll be happy to help with any adventures you have planned. WHAT DOES THE BED AND BREAKFAST PACKAGE INCLUDE? HOW MUCH DOES THE BED AND BREAKFAST COST? From €25 per night in a shared twin room— check out our Accommodation page to explore all the options. We welcome stays of all length at Hash Point Surf Camp, so just let us know how long you would like to stay! Check out our great rates for staying with us at the surf camp, and we do offer discounts for large groups or long stays. All prices shown are per night.